Having fun thank you cards on hand is just a good idea. Here is a shaker card made with new Hampton Art/Jillibean Stamp and die set called Hug in a Mug. The card starts out with a heart shaker card and insert, then the background papers were added. Do the pineapples speak to you too? Saying something like- “Come away with me to a tropical paradise.” Either that or maybe cabin fever is just setting in, regardless, could not resist them and love the resulting color palette too. The hearts pattern was also added to the background and then the green plaid border strip really set it off. Stamp the mug in gray ink onto lighter gray paper and use the coordinating die to cut out. Add the resulting gray heart to the border strip and stamp the sentiment directly onto them in black ink. Add the orange plaid paper as a backer to the shaker portion and then fill up the shaker insert with your chosen fillers. This card used the orange glitter flowers and the flower wood veneers. Then you are finished! 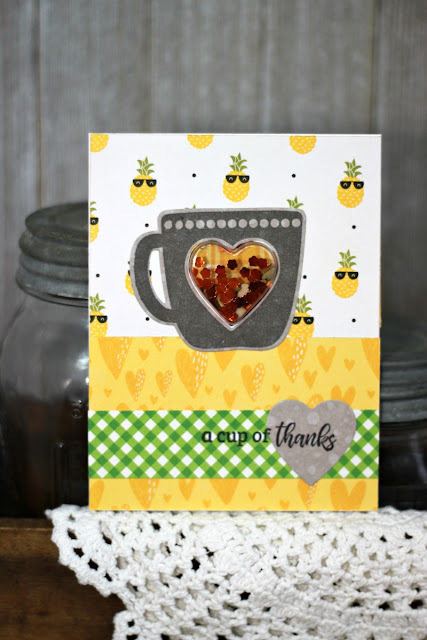 This card says thank you with a fun tropical twist.